Tumblr is an easy to use, fast growing blogging platform with a strong emphasis on simple, no hassle content sharing. I would describe Tumblr as much more attractive and streamlined than blogger and a lot simpler than wordpress. Take a look through the 15 I have gathered below for you, and you are guaranteed to find one that will inspire you to change the look of your Tumblr account. Have a favorite Tumblr theme? Tell us about it in the comments. A vintage style fully customisable theme for tumblr. 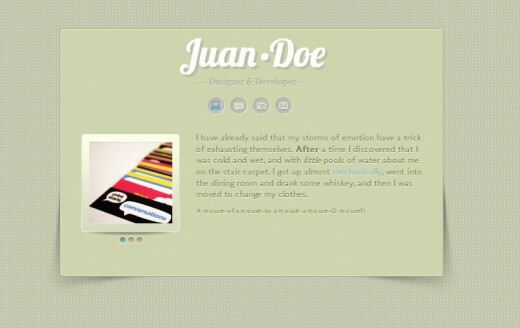 Supports all tumblr post types, recent tweets and flickr photos in a unique postcard layout. 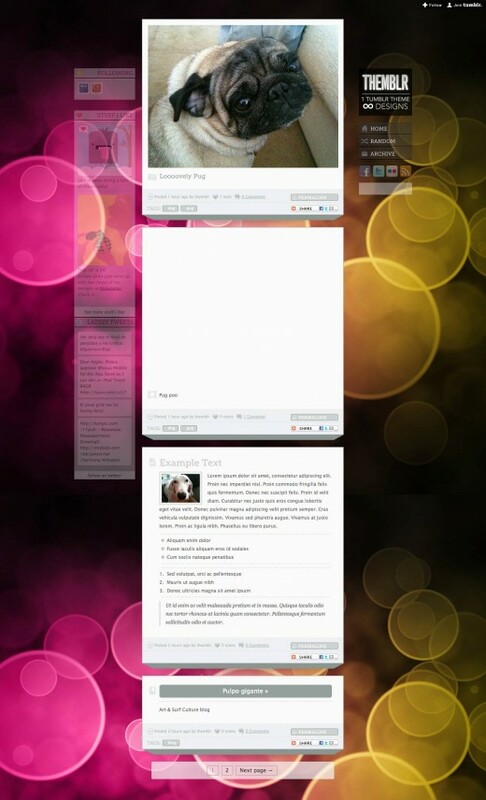 This Theme is designed for those people you want a Mini vCard Site and use Tumblr as plataform. Currently it only supports Photo-post and Photosets, you don’t have to touch the code, the Theme is configurable through a robust Control Panel. Elegantem is a Tumblr theme that beautifully merges design and function. 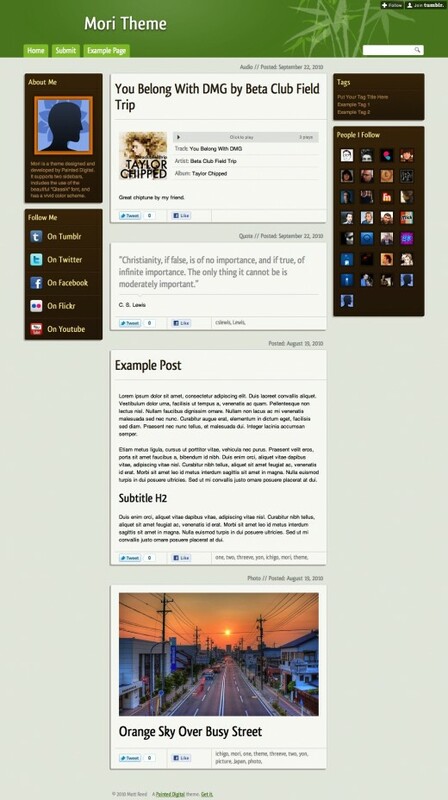 Emphasizing your latest entry, this theme has a customisable layout and even supports popular social media services. 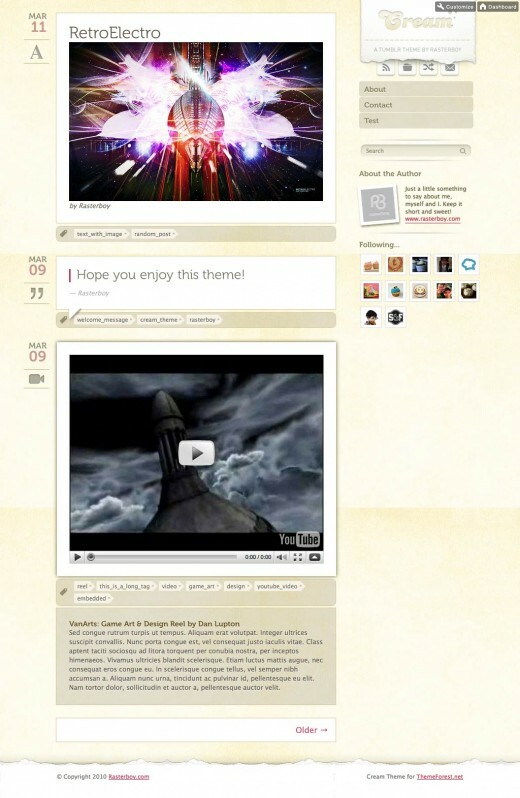 The Desire Tumblr Theme uses all the latest features from Tumblr. It is perfect for any type of blog be it for a professional business, creative portfolio or a personal blog. 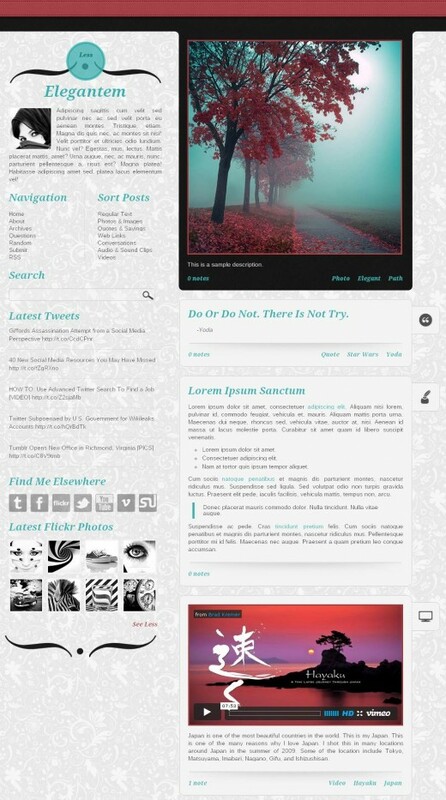 This is a 2 in 1 minimalist Tumblr theme with EXTENSIVE customization options. 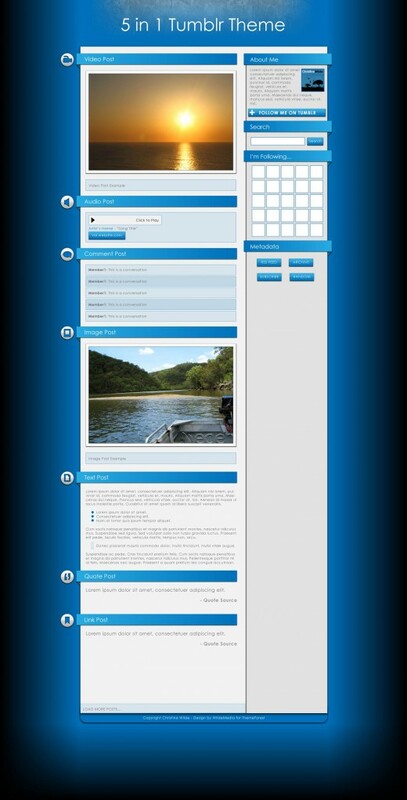 This theme puts the focus on your content and makes it look awesome as well. 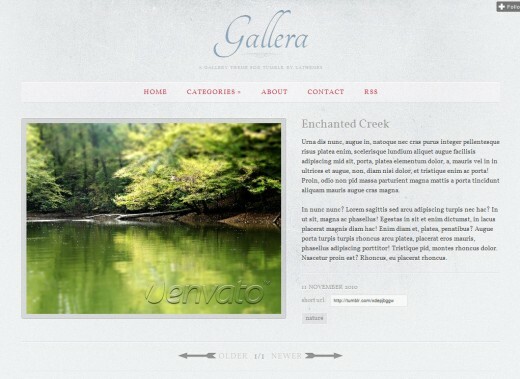 Gallera is a clean and elegant gallery theme with subtle grunge background texture and custom typography. Monocromo is a Tumblr Theme designed to be lightweight and minimal but also high impact ad customizable. 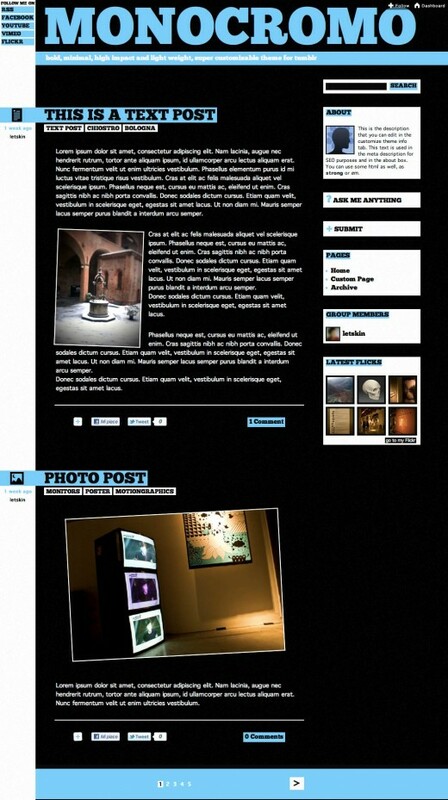 This theme is coded in html5 + css3 and every functionality of Tumblr is supported. Marigold & Patchwork is a Tumblr theme inspired by the colors, style and texture of products from famous brands like Pottery Barn, Urban Outfitters and Anthropologie. Mori is an Asian inspired theme with bamboo, beautiful greens and vivid browns. It features 2 sidebars for plenty of self-promotion and links. 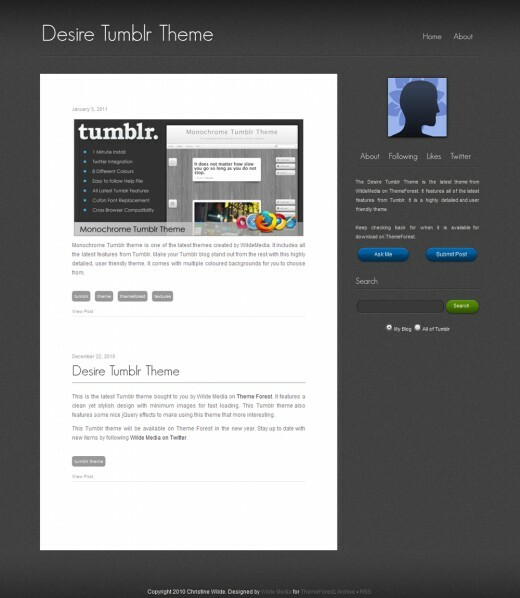 Themblr is a fresh, clean and verstile tumblr template packed full of custom functionality. 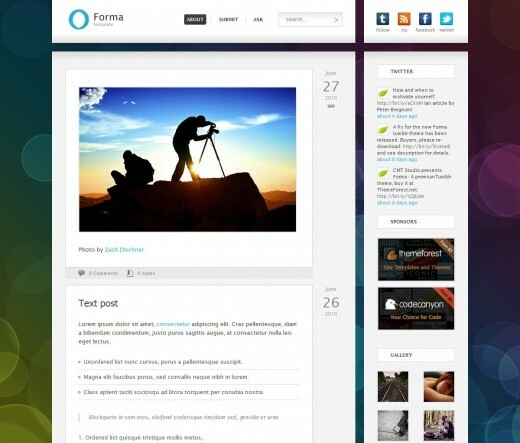 Forma offers a new concept and style to all Tumblr users. It gets rid of the regular post icons, of the typical blog design and focuses on real content, present in a refined design. This theme supports all the Tumblr features and has a content rich sidebar, featuring your favorites, twitter feed, description, search box, big avatar box and people your following. Cream is a clean and simple Tumblr theme using subtle textures and colors for a light and playful feel. Main colors are creamy tones of beige and tan, accented with pinks for links and accent items. 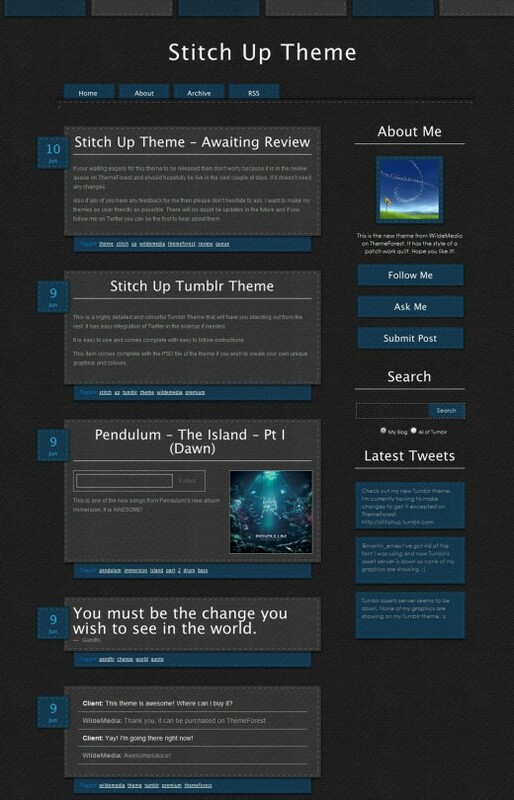 This is a highly detailed and colorful Tumblr Theme that will have you standing out from the rest. It has easy integration of Twitter in the sidebar if needed. Each post has it’s own unique header to make your posts stand out from each other.